Industrial flair meets Arts and Crafts styling in the Graphite Bunk Beds. Woods appear reclaimed; metal finishes look hand forged. The slatted bed ends of the bunk bed provides the centerpiece of this sturdy group and will anchor your child's bedroom. Rivet detailing and metal framing offer a unique, industrial option for youth furniture. The charcoal finish is kid-friendly, safe and durable for an active child's lifestyle. 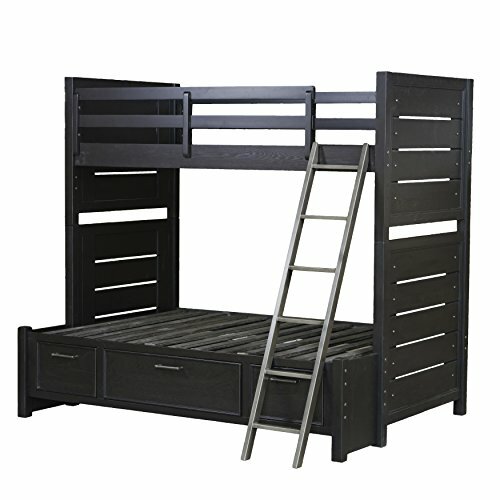 Your child can access the top bunk with the bunk bed ladder. The guard secures to the top bunk, so you can rest assure your child is secure. If you have any questions about this product by Pulaski, contact us by completing and submitting the form below. If you are looking for a specif part number, please include it with your message.